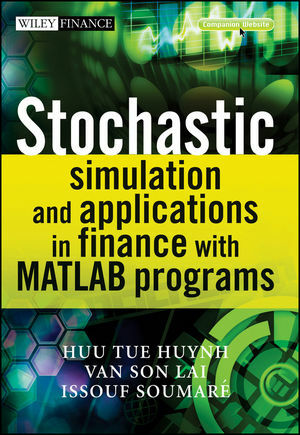 Stochastic Simulation and Applications in Finance with MATLAB Programs explains the fundamentals of Monte Carlo simulation techniques, their use in the numerical resolution of stochastic differential equations and their current applications in finance. Building on an integrated approach, it provides a pedagogical treatment of the need-to-know materials in risk management and financial engineering. The book takes readers through the basic concepts, covering the most recent research and problems in the area, including: the quadratic re-sampling technique, the Least Squared Method, the dynamic programming and Stratified State Aggregation technique to price American options, the extreme value simulation technique to price exotic options and the retrieval of volatility method to estimate Greeks. The authors also present modern term structure of interest rate models and pricing swaptions with the BGM market model, and give a full explanation of corporate securities valuation and credit risk based on the structural approach of Merton. Case studies on financial guarantees illustrate how to implement the simulation techniques in pricing and hedging. NOTE TO READER: The CD has been converted to URL. Go to the following website www.wiley.com/go/huyhnstochastic which provides MATLAB programs for the practical examples and case studies, which will give the reader confidence in using and adapting specific ways to solve problems involving stochastic processes in finance. HUU TUE HUYNH obtained his D.Sc. in communication theory from Laval University, Canada. From 1969 to 2004 he was a faculty member of Laval University. He left Laval University to become Chairman of the Department of data processing at the College of Technology of The Vietnam National University, Hanoi. Since 2007 he has been Rector of the Bac Ha International University, Vietnam. His main recent research interest covers Fast Monte Carlo methods and applications. VAN SON LAI is Professor of Finance at the Business School of Laval University, Canada. He obtained his Ph.D. in Finance from the University of Georgia, USA and a master degree in water resources engineering from the University of British Columbia, Canada. He is also a CFA charterholder from the CFA Institute and a registered P.Eng. in the Province of British Columbia. An established teacher and researcher in banking, financial engineering, and risk management, he has extensively published in mainstream banking, economics, and finance journals. ISSOUF SOUMARÉ is currently associate professor of finance and managing director of the Laboratory for Financial Engineering at Laval University. His research and teaching interests included risk management, financial engineering and numerical methods in finance. He has published his theoretical and applied finance works in economics and finance journals. Dr Soumaré holds a PhD in Finance from the University of British Columbia, Canada, MSc in Financial Engineering from Laval University, Canada, MSc in Statistics and Quantitative Economics and MSc and BSc in Applied Mathematics from Ivory Coast. He is also a certified Professional Risk Manager (PRM) of the Professional Risk Managers’ International Association (PRMIA).